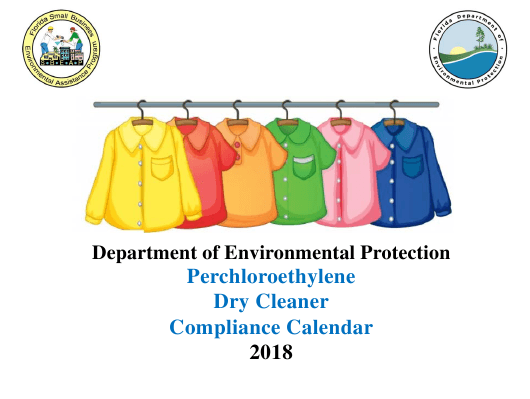 This Florida-specific "Perchloroethyle Dry Cleaner Compliance Calendar" is a document released by the Florida Department of Environmental Protection. As a dry cleaner, it is likely that you are a small quantity generator of hazardous waste. Call to obtain your required federal I.D. number. be permitted with the Division of Air Resources Management AND you need to be registered with the Division of Waste. may be eligible for site rehabilitation assistance. Call for more information on this program and to see if your facility is eligible. Use an approved waste water treatment device. ance. Keep these records at your facility for 5 years. Enter running total from last month. month last year, from last year’s records or calendar. If you buy 140 gallons or more of PERC per year, you must check your machine weekly for leaks and record the results. If you buy less than 140 gallons of PERC per year, you must conduct and record leak inspections at least every other week. be ordered within 2 working days of leak detection and installed within 5 working days of receipt. Use your halogen leak detector weekly to detect Perchloroethylene (PERC) leaks and maintain records. The Halogen hydrocarbon detector is a portable device that must be capable of detecting PERC vapor concentrations of 25 ppm by volume. Have you changed your waste water treatment filter according to the manufacturer’s specifications?